Sydney Craft Week returns in 2019 with a mission to recognise the exceptional quality of local craft, while also unlocking our sense of joy in making with the theme “Play”. Australian Design Centre is excited to be launching the third Sydney Craft Week (SCW), a ten-day festival from Friday 11 – Sunday 20 October 2019. SCW unites the very active craft sector within Sydney's creative community - including ceramicists, jewellers, quilters, knitters and other textile artists, plus timber workers, print makers, leather crafters, Indigenous makers and creatives of all kinds who work with their hands. Events are held all over Sydney, from inner city, to suburbs north, south, west and east of the city centre – with a spattering of events found in the Greater Sydney region and beyond. Play is this year’s festival theme. The act of playing allows us to create openly, with a sense of spontaneity and joy. It gives us license to be experimental, to try new things and make mistakes. Play is educational – it helps us to discover or rediscover techniques and to consider new thinking and concepts. In 2019, SCW encourages you to immerse yourself in all things play. Switch off and create. Be inspired to consider new possibilities. Dive into a new craft or reconsider your approach to creating. Play should not just be for kids– we want to see young and old and everyone in between cutting, pasting, hammering, stickering, sewing, weaving, wielding, squishing, firing, carving, building, moulding, embellishing and reinventing. Playing for the sake of play! Creativity is encouraged in submissions to this year’s festival. We want to see how you play with this theme. We are delighted to have the support of our 2019 Advisory Panel to help shape the festival. Thank you to: Sky Carter, Liza Feeney, Felix Gill, Bridget Kennedy, Deb McDonald, Janine Smith and Bic Tieu. We will be introducing the panel to you over the next few weeks on social media. On 2 May we will be opening up the application process for this year’s program. Galleries, retailers, art and design schools, cultural institutions, organisations, collectives and individuals are invited to register an event to be part of the festival. Events might be an exhibition, talk, workshop, market, retail event, open studio or installation. Please note that this year, SCW has changed the terminology for entries from “EOI” to “entry” – the process has not changed and entrants are still required to pay their participant fee on submission of their entry. Stay tuned next week for more information on the application process and festival program. Find SCW news stories here. Thank you to Paula do Prado for sharing these images with us. 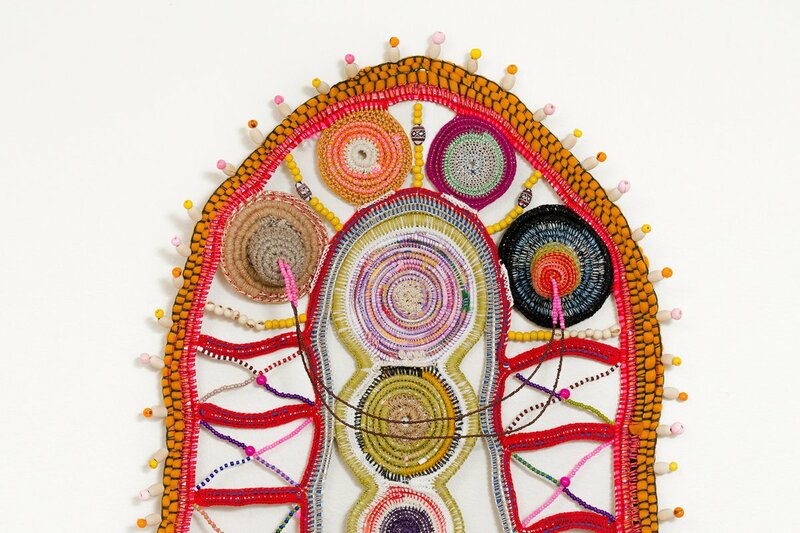 Paula do Prado lives and works on Gadigal Land (Sydney). Born on Charrúa and Guaraní land (Montevideo), Uruguay, Paula emigrated to Australia in 1986. Her work explores the intersections between her African, Hispanic and European heritage together with her experience of living as a migrant on stolen land. Paula’s practice is predominantly textile based but also includes self-portraiture, painting and objects.